Hello all - for those of you who follow me on Twitter you may already have seen a few pictures of these guys, but they made their debut at Waaaghpaca's Friendly Tournament with the rest of my painted Raven Guard. When the new Primaris marines came out from GW I really liked them and dove in with the starter box. However, it took me nearly 6 months to finally completely paint my first unit. The easy thing was picking my chapter for my Primaris as the Rift Stalkers (GW created) fit perfectly in with my Raven Guard "normal" marines. The color scheme was basically opposite and allowed me an opportunity to challenge myself and paint something different, white, which I hadn't done in such large portions before. 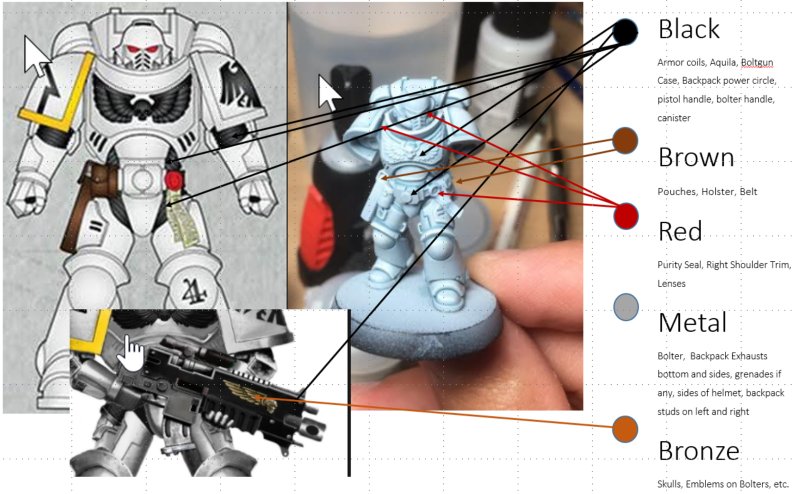 When looking at the Primaris marines and the color scheme of the Rift Stalkers I considered a few things before working on my first Test model. The first was how to get the smooth white without having to succumb to layer upon layer of thinned paint. I also needed to decide what kind of white I would use, dirty/cream white, darker/gray white or even a cool blue white. In the end I decided I didn't like the examples I had seen online using a brown as the shade nor did I want them to be a gray white as I felt like it may end up being a bit too monochromatic. In the end I went with the cool white which really fit in well with my Raven Guard who had the cool black. To help I created the image above to outline which parts would be which color so I didn't waste any time having to bust out the same paints more than once. I knew all the parts that would be brown/ black etc going into it so I could do them all at once. After finishing the test model and only tweaking a couple things I had my color scheme jotted down into my journal and was ready to start knocking more of these guys out. Unfortunately other stuff got in the way, but I was really happy to get back to them when I did and had a blast getting the unit completed. Primaris Librarian - Excuse the washout on the white shoulders, still working on my light set up to get the best pics. Below you can see some WIP shots of the basing as well as the 4 models and their guns behind them. This is a WIP shot of the Librarian's force sword. This was the first time I've attempted this with a force weapon using the airbrush and although it didn't come out perfect it went pretty well for my first attempt. I think moving forward if/when I do it again I'll adjust my PSI on my compressor as I feel I needed a bit more control than I had but pressure kept me from getting too close to the sword. I'm not sure when I'll get to my next Primaris unit, I'd like to do the Redemptor Dread but may opt for a Lieutenant and a unit of Helblasters instead.